If you are looking for professional oriental rug cleaning services in Northern New Jersey, look no further than Reilly’s Oriental Rug Cleaning. We are a full-service carpet care specialist that can clean and repair a wide range of oriental rugs for homeowners and businesses at the most competitive rates. Oriental rugs are made in a wide array of countries, including Pakistan, Russia, Turkey, China, and more. These rugs can be found in many homes and offices and are often purchased an aesthetic improvement or an investment. If you own an oriental rug, you will need to clean and maintain it on a regular basis. Without a regular cleaning schedule, soil, sand, grit, and dirt can gradually accumulate on the rug’s fibers. These elements can act as an abrasive and may create an unpleasant surface to step on. Oftentimes, oriental rugs are made from natural materials like wool and other manufactured materials such as polyester. The majority of the rug’s materials can be delicate. That’s why conventional cleaning methods and products may not be suited for the dye, fibers, and weave of an oriental rug. If the wrong cleaning solution or technique is applied to the rug, they may accelerate the product’s deterioration. What are the Benefits of Oriental Rug Cleaning Services? Professional oriental rug cleaning services ensure that your investment does not ruin the décor of your property. In addition, it prevents children and the elderly from falling ill or getting infections (e.g., asthma attacks or athlete’s foot) due to having dirty rugs around the house. Ultimately, clean rugs ensure that bad odor does not spread throughout your property’s interior. Whether you own a Persian rug or a silk carpet, we can clean any type of rug in the most effective and safest way possible. Founded in 1918, Reilly’s Oriental Rug Cleaning has been in business for over 100 years. We are a family-owned business and our brand is trusted by many generations. When you choose us to clean, repair, or restore your oriental rugs, you can expect to receive unparalleled customer service. 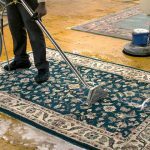 In addition, our carpet care company utilizes state-of-the-art cleaning equipment such as Moore Roll-a-Jet cleaning machines, climate controlled dry rooms and the latest computerized technology. That’s not all; these equipment are also operated by highly trained and certified carpet cleaning specialists who have many years of experience in the carpet care industry. Most importantly, Reilly’s Oriental Rug Cleaning does not charge hidden fees; we do not condone any type of predatory pricing practice. Are you interested in using Reilly’s Rug and Carpet Cleaning’s oriental rug cleaning services? Do not hesitate to call 201-445-0800 or email us at Info@RugClean.net for more inquiries.